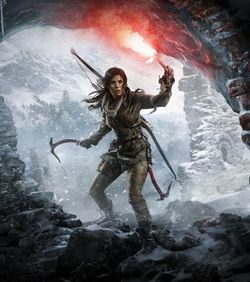 Rise of the Tomb Raider (short Rise or RotTR) is the title of the tenth Tomb Raider Game, in which Lara Croft has to use the skills she learned in Tomb Raider - A Survivor is Born and accept her destiny as a Tomb Raider. Overcoming the trauma of being stranded on Yamatai, losing so many friends and having killed for survival, she embarks on a new adventure to find more evidence for the supernatural and hints of immortality she witnessed in Queen Himiko. Unlike in the reboot game exploring tombs once again plays a major part in Rise of the Tomb Raider. Rise's successor called Shadow of the Tomb Raider, continuing the Reboot storyline was announced on 15 March 2018. It will be released on 14 September 2018. The game has been release on November 10th 2015 (US) and November 13th (EU), exclusively on Xbox. It is developed for Xbox One and ported to Xbox 360 by Nixxes. An improved version is available for the new Xbox One X since 7 November 2017. Owners of Rise of the Rise of the Tomb Raider: 20 Year Celebration for the original Xbox One will get an update free of charge to take advantage of the new hardware features. A PC Windows 10/Steam version was released on 28. January 2016. In addition to the features of the Xbox One version it supports 4k resolution. The System Requirements for the PC version are rather steep. The game supports many new features that are heavy on both CPU and GPU, like trails in the snow, even more detailed hair simulations, and post processing. Owners of a PlayStation 4 Pro will be able to enjoy 4k gaming and/or improved graphics. Feral Interactive announced a Version of Rise of the Tomb Raider: 20 Year Celebration for Linux and MacOS X on 13 February 2018. It was scheduled for release in spring of 2018 and arrived on 12 April 2018 on the Mac and 19 April for Linux. As of 2018 no versions for other platforms (Nintendo, Last Gen Consoles besides Xbox 360) have been announced. A well-funded, shady organisation called Trinity has covered up the events that happened on the island of Yamatai and Lara’s own accounts of the events have been discredited. Having listened to the old tapes her father left her, Lara sets her sights on a fabled tomb said to house the soul of an immortality-granting Prophet and travels to Syria, which in turn leads her to Siberia in search of the Lost City of Kitezh. She is not alone on her quest as Trinity follows her with armed and hostile soldiers. Also, her friend Jonah Maiava will accompany Lara to Siberia. There she will find the Remnants, a native people protecting Kitezh, and ally herself with them. There are 15 Locations and 43 Base Camps in Rise of the Tomb Raider; seven of these Base Camps are located in Challenge Tombs. There is one additional Location and two more Base Camps in the Baba Yaga: The Temple of the Witch DLC, bringing the total up to 16 Locations and 45 Base Camps. There are 43 Levels spread across Syria and Siberia, the table below shows where each level begins (but not necessarily where it ends). The Baba Yaga DLC is not divided into levels, as it is independent of the normal game's progress, but rather into separate missions, which are listed below instead of levels. Note that these missions do not necessarily start in the Wicked Vale but may start in the Soviet Installation. Unlike the 2013 reboot Rise of the Tomb Raider features many new tombs that can be explored by Lara. Many of these tombs are optional and must not be investigated during the main mission, but some are an integral part to the main story line. In order to finish the game successfully, these must be visited. Also, the developers promised more puzzles with a higher difficulty than in Tomb Raider (2013). The game features multiple locations, for example icy mountains with caves Lara can explore, located in Siberia, as well as desert tombs on the Syrian border. Hunting and upgrading of items are once again an integral part of the game. A new Crafting system complements the old upgrade system: The game is set in a similar situation as the reboot where Lara must gradually collect and upgrade her gear. For example she has to build a Base Camp by scavenging wood and pelts. Plants and animals "don't spit out magic XP or the nondescript 'Salvage' used to upgrade in Tomb Raider, but offer specific materials: wood from saplings, Hide from a Deer half-finished by Wolves." In addition, leaves can be used to heal wounds and common resources like Mushrooms let Lara craft special ammo, such as poison-tipped arrowheads. Gear upgrades require rarer materials, from animals that now respond to time of day. An alpha wolf only emerges at night, for example, bringing with him the hide for a nifty furred hood. The player also has a choice over what equipment to improve. For example the first bow, which is made from materials found in the Siberian wilderness, won’t necessarily be replaced by shinier models; it has its own upgrade path and can be kept as the primary weapon. Complete challenges while replaying certain chapters of the main story. Replay chapters and gain points for special kills and collecting pick-ups. Play and create custom missions in the game's hub locations. Survive the harsh conditions of Siberia for as long as possible and collect artefacts. Using Expedition Cards the player can modify Lara's abilities and the rules of the game during these expeditions. Lara's main weapons again is the Bow and her Axe. She now automatically use Glow Sticks to light dark passageways. Further gear, such as a Lock Pick, can be gained through a Side Mission. Weapons can be switched using the D-Pad of the controller. There are four slots available, one for each type of weapon. The weapons ion these slots can be changed when visiting a Base Camp. Outfits can be changed at any Base Camp. For a complete list, see Lara's Outfits#Rise of the Tomb Raider. It has been confirmed that a similar concept as the one used in Tomb Raider (2013) will return. There are mysterious lamps throughout the demos showcased at 2015s E3, which might or might not be lit up as part of a challenge. It has been hinted, that GPS Caches or other secret items will also return, and that they might hold another secret hint at something that comes later, just like finding the final caches in the reboot hinted at the Trinity organization. Later in the game Lara will meet and befriend the Remnants, that will give Lara side quests that provide her with additional XP and earn her access to new areas, items, and abilities. There are several kinds of enemies in the Rise of the Tomb Raider game. E.g. early in Sibiria Lara has to face a Bear and a Mercenary. Wolves also roam the wilderness and threaten Lara. Some of these Animals will attack Lara, but most will flee her. They can be hunted for XP and Resources. In the main game there are 66 Xbox One Achievements, 50 Xbox 360 Achievements, and 66 PlayStation 4 Trophies. Combined with all the Downloadable Content released (included in the Rise of the Tomb Raider: 20 Year Celebration edition) there are over a hundred Achievements/Trophies to collect. She again is head writer. A preview of the soundtrack has been uploaded to Soundcloud early in October 2015. The complete Soundtrack has been published on Soundcloud on 6 November 2015. 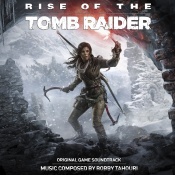 The song that can be heard in the background of the Rise of the Tomb Raider Launch Trailer (Make Your Mark) is an exclusive by Karen O, titled "I Shall Rise". Camilla once again features as the Motion Capture actress for Lara Croft. For older news concerning Rise of the Tomb Raider before its release, see Rise of the Tomb Raider/Old News. A first trailer was released at E3 on June 9th, 2014, and can be viewed on YouTube. At E3 2015 several in-game demos have been showcased. YouTube, Trailer and Gameplay E3 2015 A list of trailers and background information can be found in Rise of the Tomb Raider Playlist by tombraidergirl. Rise of the Tomb Raider has been awarded "Best of E3 2015" by GameSpot on June 16th 2015. This page was last modified on 18 April 2018, at 18:08.